I'm looking for a recording bell for a Martin Mammoth. Condition isn't super important (within playable limits). If someone has a tenon for the same bell, I'd be interested in one of those as well. Last edited by YORK-aholic on Wed Oct 10, 2018 1:48 am, edited 1 time in total. I have a Martin Mammoth with a recording bell, and I've been wanting to get an upright bell for it. Would you be interested in a trade? I assume you have an upright bell? Well, that won't work, as I have a Martin carcass without a bell at all! YORK-aholic wrote: Well, that won't work, as I have a Martin carcass without a bell at all! I assume you bought one of the two Marin bodies that were on eBay recently? Sorry to hear that! I was thinking it was a perfect trade for a second. I'll take your recording bell off you anyway. Only if you buy the rest of the horn with it I'll be posting it in the "for sale" section within the next week or two after I've cleaned it and re-aligned the valves! YORK-aholic wrote: I'll take your recording bell off you anyway. I thought hard on those two, also. Did you get the straight one or the one with a slightly squished stack? If/when you get a bell, either one should be a player. I took the first one (slightly squished stack). Not a big issue, the rest of the body is in very good shape and it has the original receiver. FWIW I have a silver plated "Martin Handcraft" recording bell (pretty sure not Mammoth) that I have no use for unless someone has a body that it fits. Some dents, tenon is bent a bit (I can fix), most of the plating is there. No photos ATM but if someone can use It I'll be happy to make some. Thank you for the offer, but I believe you are right that it isn't a mammoth bell as the tenon is a bit small. 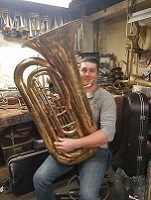 I got a hold of a Holton 340/345 upright bell. It matches the taper/profile of the one piece upright bell on my 1958 USN Martin Mammoth pretty closely. If you still need a bell your Martin, this here has shown up on eBay. It would also give you extra parts for your tuba. Gus_Pratt wrote: If you still need a bell your Martin, this here has shown up on eBay. It would also give you extra parts for your tuba. I have got to stop buying these things, or else start selling some of them. Otherwise, my place is going to look like Lost's must: tuba store room with a bit of living space squeezed in among them! YORK-aholic wrote: I have got to stop buying these things, or else start selling some of them. Otherwise, my place is going to look like Lost's must: tuba store room with a bit of living space squeezed in among them! I'm lucky to have a storage space in my dwelling. Must control purchasing impulse and encourage selling impulse. I have both the bell and stack available from the same horn. I have no idea what they are worth. are interested let me know. They are both in good condition. I'll be back with a price shortly. I can take some pics today. I have the same problem. Need to sell some of this heavy metal.